The accompanying 65-minute audio CD presents six relaxation and visualization techniques, including a 20-minute guided relaxation practice designed to ease one into a deep, peaceful sleep. Sadler teaches the skills needed to break the patterns and the frustration of insomnia. She explains how to overcome stress and restlessness through meditation and deep diaphragmatic breathing, how to prepare for sleep through positive visualization, and to quiet mental chatter with awareness, physical techniques and exercises. She addresses how to reduce dependence on sleeping pills, determine the amount of sleep you truly need and how to retrain yourself to sleep soundly. She provides a two-week sleep diary and shows how to identify and analyze any underlying daytime and pre-bedtime habits that can disturb sleep. In addition, the accompanying 65-minute audio CD presents six relaxation and visualization techniques, including a 20-minute guided relaxation practice designed to ease one into a deep, peaceful sleep. By revealing the keys to quality, drug-free sleep, the book and CD enable you to reclaim control of your sleep cycle and your life. 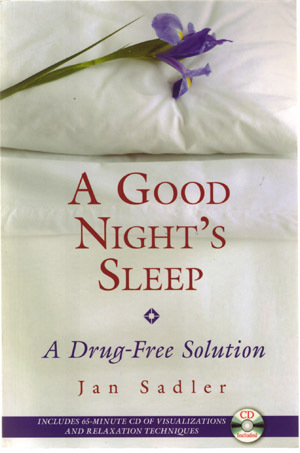 The book also presents visualizations, deep breathing and mindfulness meditation techniques to prepare for sleep, and how to retrain the body to sleep solidly. $16.95 — Healing Arts Press, One Park St., Rochester, VT 05767.